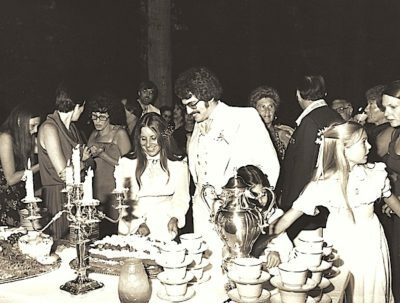 THE COHENS wed in 1977. In 1973, Lyn MacEwen was a single mom working on Park Avenue, when she and a girlfriend stopped for a cappuccino at Caffe Reggio, in Greenwich Village since 1927. Standing at the end of a long line, her friend was soon engaged in conversation with a group of guys, one of whom was Marc Cohen. A law student at New York University, he was cute, says Lyn, but she was not interested, and what’s more she was trying to get her friend’s attention to leave the crowded cafe. “He was very friendly. I’m very shy by nature. I didn’t want to wait in line,” Lyn explains. While she was thinking of an exit plan, the maître d’ asked Marc how many were in his party. “Seven,” he said, and “all of a sudden, in we go,” says Lyn. He must have charmed her as they sat, drinking their coffee, as she agreed to go ice skating with him that Saturday night in Central Park. They carried their ice skates over their shoulders again the following Tuesday. They married in 1977, and in addition to her daughter from her first marriage, the couple had two more daughters. They first lived in Miracle Mile, where Cohen is president and founder of the Miracle Mile Civic Coalition. THE COUPLE recently went ice skating as they did on their first date. Marc is a lawyer with Loeb & Loeb. They have fallen in love with their Hancock Park neighborhood — it reminds them of their East Coast roots — and they love Valentine’s Day. “I think love is very important,” says Lyn. 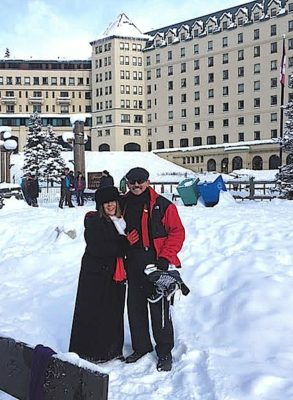 The couple recently returned from a winter wonderland at Lake Louise in Canada, where they cross-country skied, rode in a horse-drawn sleigh, and once again donned ice skates, this time on a lake.